Congratulations goes to Andrea of Foley, Alabama, our winner of the book giveaway Angels by Dr. David Jeremiah. I am also writing to say "Goodbye". As you have no doubt noticed, my posts have been few and far between the last few months. I've been so busy, I just haven't had the necessary time to devote to blogging and there's no let up in sight for my schedule. SOOOOOOO, much as I hate to do it, I'm going to stop blogging. Who knows, maybe there will be room for it at some point in the future. It's hard to believe I've been doing this for two years already. It feels like I just began yesterday. Thank you, everyone, for listening to my ramblings! I've meet some great friends in the blogosphere and I appreciate all of you. Angels by Dr. David Jeremiah is very complete on the subject of angels and extremely well grounded in scriptures. If you want to become an authority on the topic of angels -- what the Bible says, their role, their characteristics, what they are NOT despite public thought -- then this is the book for you. I found this book more "textbook" than engaging, but it's hard to be scholarly and definitive AND entertaining at the same time. That's not to say it's a hard book to read; in fact, it flows easily. If you're really interested in what the Bible says about angels, Angels by Dr. David Jeremiah is a must have book. GIVEAWAY: I have one copy of this book to giveaway. To enter the random drawing, please e-mail your name and mailing address to seewhykinsman@gmail.com. The winner will be announced Friday, February 5th. Congratulations to Eric of Pensacola, Florida, the winner of Tea with Hezbollah by Ted Dekker and Carl Medearis. Check back Monday for another book review and giveaway. Jesus, Gandhi and Martin Luther King, Jr., among others, all taught us to love our enemies. With this in mind, the authors, Ted Dekker and Carl Medearis, decided to see if it's possible to love one's enemies. Tea with Hezbollah, Sitting at the Enemies' Table, Our Journey Through the Middle East is the result of their exploration. The authors met with leaders of the Muslim world . . . often time the extremist Muslim world . . . to find out what they think about the "love your enemies" teaching. The authors wanted to know how they felt about it, did they think it possible, how is the non-Muslim world not loving them, etc. Tea with Hezbollah is an ambitious work to understand "our enemies" in order to love them, and perhaps, for them to get to know and love us as well. We [the authors] are both Christian. We both cringe at being called Christian, because in both of our worlds, Christians are the bad guys who either slaughter civilians or destory civilization in the name of God. The authors frequently inserted transcripts of their actual interviews with various Muslim leaders which was facsinating and lead to their credibility because they didn't always put words in the mouths of their subjects. Giveaway: I have one copy of Tea with Hezbollah to give away. To enter the random drawing, please send your name and mailing address to seewhykinsman@gmail.com. The winner will be drawn Friday, January 22, 2010. Good luck. I know I've been "absent" of late . . . my busy life seems to be raised to the "Nth degree" these days. Congratulations to Andrea of Foley, AL, this week's winner of The Male Factor by Shaunti Feldhahn. Check back regularly for more book reviews and giveaways. How to Become "One of the Boys"
It's no secret that women make about 70% of men and in many industries, the glass ceiling is a real barrier for women. 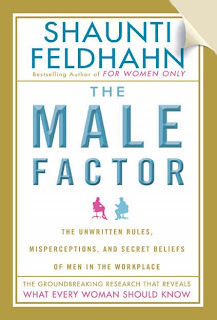 However, in her new book The Male Factor Shaunti Feldhahn shows women what they are unconsiously doing wrong in the business world which is shooting them in the proverbial foot. Shaunti Feldhahn has done a lot of research to get inside the male psyche to figure out what men think and feel in the workplace, what unwritten codes of conduct they live by, how they perceive women in general and their actions in the workplace, and what women can and should do in order to succeed in their careers. The information Shaunti has compiled is sometimes surprising, sometimes almost unbelievable, and always helpful! This book is a must-read for every career or business-minded woman. Incidentally, its insights will also help you with your marriage and friendships because you will have a greater understanding of what men experience at work. Book Giveaway: I have one copy of The Male Factor by Shaunti Feldhahn to give away. To enter the random drawing, please send your name and mailing address to seewhykinsman@gmail.com. The winner will be drawn on Friday, January 15th. The Male Factor equips women with the information they need to make informed decisions and compete on a level playing field. I am a vegan, a Messianic Jew, an animal rights activist, a “rabid” environmentalist, an avid reader, a wife, a daughter, a sister, a friend and all-around nut! I’m looking forward to getting to know you! I am also a reluctant blogger. When I was a kid, I asked my parents for a diary. My dad cautioned me about sharing my secrets and especially putting them in writing. I got my diary, but couldn’t write more than about three half-hearted entries such was the level of my paranoia! A friend of mine once explained she started blogging as a discipline for writing -- she needed someone to read to hold her accountable to the goal of writing every day. That's why I'm blogging Monday through Friday -- as a discipline to write, to share whatever wisdom may be in my ramblings, to learn to open up to people and to see where it goes from here. Thank you for joining me on my journey; I appreciate your taking the time to read and I welcome your comments. You can also e-mail me at seewhykinsman@gmail.com.